Feel the great expansive openness of the West Coast with its big blue skies and its ever developing but still youthful capital city of Perth. You will be personally met at the airport by a DISCOVER AUSTRALIA representative and transferred from the airport to the Victoria Quay Passenger Terminal to board the Vasco da Gama, for a whirlwind cruise along the South West coast of Western Australia to celebrate Australia Day. 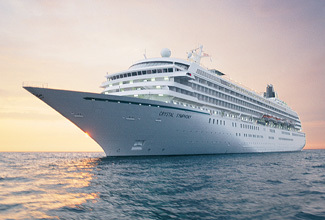 The Vasco da Gama boasts an unforgettable and intimate experience of fine dining, high class entertainment and luxurious cruising aboard this stylish modern boutique sized ocean liner. Cruise from Fremantle through the expansive Indian Ocean south towards our destination Geographe Bay where the Vasco da Gama will anchor. Today, you will be personally met at your hotel by a DISCOVER AUSTRALIA representative and transferred to the Victoria Quay passenger terminal to board the Vasco da Gama for your 1 night cruise. Spend the day at sea and make use of the facilities on board the Vasco da Gama such as the Wellness Centre or take part in some of the daytime activities such as guest speakers and arts and crafts workshops. Today we celebrate Australia Day in style, anchored in the calm turquoise waters of Geographe Bay, off the coast of Busselton in Western Australias south west. Today you cruise back to Fremantle for some time to explore Perth. This morning when you arrive you will be personally met at the Victoria Quay Passenger Cruise Terminal by a DISCOVER AUSTRALIA representative and transferred to your Perth hotel. Meet and Greet Personalised Port Transfer, overnight accommodation. Today you will see Perth City, the famous WACA (Western Australia cricket ground), impressive Swan Bell Tower, Perth Town Hall, St Georges Terrace (hub of Australia's minerals and energy industries), Barrack Street Jetty, Perth Mint (working gold mint, stunning sandstone colonial architecture), Old Swan Brewery and Royal Perth Yacht Club (once home to the America's Cup). Stop at magnificent Kings Park for spectacular views over Perth skyline, Swan River and Melville Water. Walk through the tree canopies on the Tree Top Walk see the 750-year-old boab tree. See famous Cottesloe Beach and the Indian Ocean sunset coastline. Tour Fremantle (historic large working port docks, rich convict history, glorious alfresco outdoor dining, marinas, charming heritage sandstone buildings, modern ocean racing yachts, colonial terraced houses, museums and galleries). Enjoy some free time in Fremantle to explore the colourful streets for yourself, perhaps enjoy a coffee on South Terrace's Cappucino Strip or indulge in some shopping in the many unique shops or find a bargain at the weekend markets. On our way back to Perth City we see some of Australia's most expensive real-estate at the upmarket Swan River suburbs of Peppermint Grove and Dalkeith. Time this afternoon to explore more of Perth on your own. Luxury Day Tour with Hotel Pick-Up, Overnight Perth Accommodation. Enjoy free days to explore the city at your own pace. As you embark upon your epic transcontinental adventure aboard the Indian Pacific from Perth to Sydney you're about to experience one of the world's great railway journeys, from the luxury of your cabin window the view changes from the verdant hues of the Avon Valley to the vast treeless Nullarbor plains and the sensational view of the majestic Blue Mountains as you approach Sydney. See below for full details on your Indian Pacific journey. Note: passengers disembarking in Adelaide depart on Day 11. 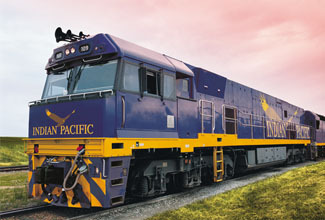 Hotel to Railway Station Transfer, 3 Nights Gold Service Cabin on the Indian Pacific (2 Nights to Adelaide), 3 Breakfasts, 3 Lunches, 3 Dinners, Luxury Kalgoorlie Coach Tour, Luxury Adelaide Coach Tour, Luxury Broken Hill Coach Tour (Perth to Sydney customers only), Meet and Greet Personalised Departure Transfer. For customers travelling from Perth, the package is 11 days in duration, travelling Adelaide to Perth on the Indian Pacific. You will be personally met by a DISCOVER AUSTRALIA representative and transferred from Perth airport to your the Vasco da Gama and from the Vasco da Gama to your Perth hotel. From your Perth hotel to the Indian Pacific railway station to begin your journey to Sydney. On arrival in Sydney you will be transferred to the Sydney airport for your flight home. The Indian Pacific to Perth with Australia Day Weekend Vasco da Gama Cruise is very popular. Many dates book out well in advance, please book soon.